It’s always such a pleasure to be back in Spain. Just to feel this hot sun on our skin and get some sea food in our bellies. James and I were really looking forward to our stay in Barcelona for the Sonar music festival as the special guests of Guess. After Coachella, we’ve been longing for another music festival experience, it’s the perfect activity for summer. 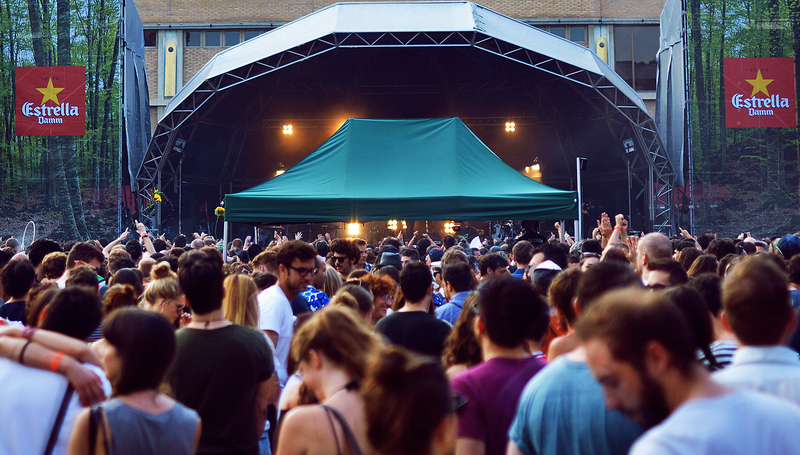 We’ve heard so so so many good things about Sonar and how it’s THE event everybody is talking about at the moment. 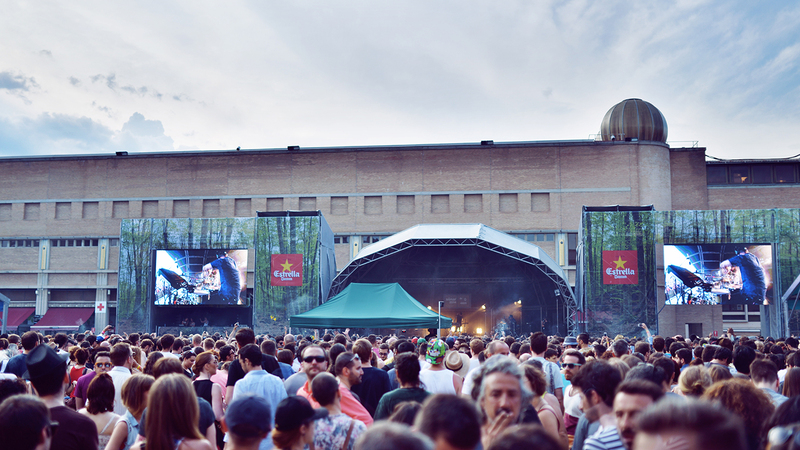 Rumours go that it’s one of the best music festivals in Europe! Now that we’ve officially attended, I can say that I really enjoyed it. The ambiance is very different from Coachella. The music is less commercial I would say, bands who play at Sonar are more electro oriented or have more conceptual performances. I would say that the ambiance is quite hipster and artsy but it’s definitely so cool. I loved looking at people, everybody had such an established style. Guess with super long beards, girls covered in tattoos with little peach jumpsuits and round reflective sun glasses. The fashion is just insane. For the occasion, I also felt like rocking something cool and edgy yet with my always elegant twist. So I picked this look from the pre fall collection of Guess. Just felt like this little black dress was perfect for the festival matched with those comfy gold embellished sandals. Not to mention that finding a bag to go to a music festival is always quite tricky as you want something small enough to be able to jump around yet practical to keep all your essentials in it. This little Guess pouch was the perfect accessory. Absolutely the best photos i've ever seen !!! you look flawless with hat ! The outfit is perfect for Sonar! I am going to be in Barcelona in july! Need to get my summer clothes in order! Oh my gosh girl, eat something... you have a total skeleton look in that little black dress... :-( have you lost like 1 or 2 sizes ? Such a perfect Look for a music festival!! You look adorable with this hat :) Love your smile! Amazing jacket, and then I look, oh of course, it's Chloe. Wow super cool total black look. Esp. love the top and earrings. I was walking around that festival wondering what was going on because it looked so cool! Had no idea it was Europe's largest festival! Saw lots of great outfits there and yours is nice! Your pictures are so fabulous! 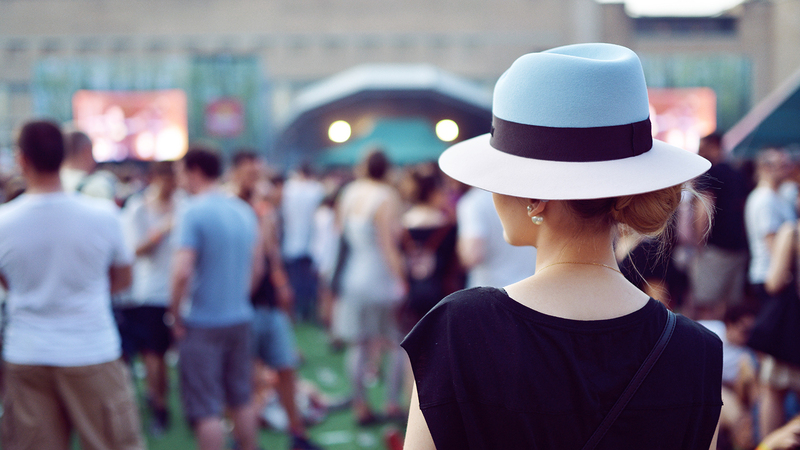 Love your hat and, of course, your sandals. By the way, can't wait to hear the song you are recording. Great look, the hat looks perfect on you! never been to Sonar, would love to try once! Oh my God, I am SO SO in love with your gorgeous accessories!!! From the hat to the amazing earrings, it's simply perfect! I like your outfit very much. It's beautiful and mysterious, but I think it's too beautiful for a festival. I go to rock and metal festivals very very very often and they are all about the music. No one cares about fashion or clean shoes. It's dirty and simple. There are a few stages and a food court, that's it. People wear old jeans, a t-shirt from their favorite band, a hoody and converse. A festival is a three day event without even thinking about showering. You go from act to act, enjoying the music - dancing - running- screaming. It can be exhausting, but for me this is more relaxing than any wellness weekend. This festival looks too sophisticated. And the architecture (the small pieces of it that are seen on the photos) is wonderful !!! Top and jacket are both really cool and the hat gives a very nice touch to the look! One if your best outfits lately! Everything is just pure perfection! get rid of the hat.....!!!! Welcome again ! Love this outfit so much. Gorgeous photos again. Amazing outfit! I love the hat especially! I'm sorry to say this but honestly this is not my favourite look. Kinda different from your usual style? Not that you can't experiment of course; this is just my personal opinion :) The hat is really cool though! What do you do with all your clothes after you've worn them once for the photoshoot? Do you give them back or do you have a huge wardrobe? I love the outfit; it is true to your aesthetics. amazing outfit, and I'm so in love with the jacket! Ohh, love this look so much! Especially the hat, a Maison Michel hat is my dream for years and this one is so perfect! Stunning, that hat fits you so well, love everything about this outfit! Absolutely in love with your hat and the Alex Mika earrings! Adore your earings. Your look is flawless as always and you are so skinny. I'm happy that you had fun at Sonar, it's amazing! Gorgeous and smart outfit ! I love the hat ! I love this look, you're pretty! Sooo amazing! You look beautiful. That Maison Michel is the best hat I have ever seen, and looks so chic paired with the Mises en Dior earrings !! Love the look!! The hat and the skirt are so gorgeous!! Love the dress and the jacket so much! Perfect look and I love that you always add a little elegant twist in your edgy looks! I love the outfit and you're soo pretty! Der Hut steht Dir super. Ich trage selber auch gerne Hüte. This is a great look. I love the jacket. I love this styling on you ! You definitely know how to rock those jewelry pieces ! I'm loving the outfit but this hat looks so funny on you! Such a cute look, love the jacket! That jacket is striking! Love it. Gorgeous festival outfit. That hat is perfection. Love it. I Love your Outfit…every little detail. BUT, this hat doesn't suits you in any way. Sorry for saying that, because I always LOVE your style. And I never heard about Sonar Festival *ops*. Such a cute outfit! Love the hat! You look so pretty and i love the textures of the dress. Amazing!! Love those shoes and the look is casual yet elegant..
Oh youre an inspiration for me! love your classy lokk as always. I'm soo in love with this hat, incredibly cool! Amazing look as usual! I am in love with your hat! Awesome Styling! On peut tе dire quе ce n'est guère faux ! !